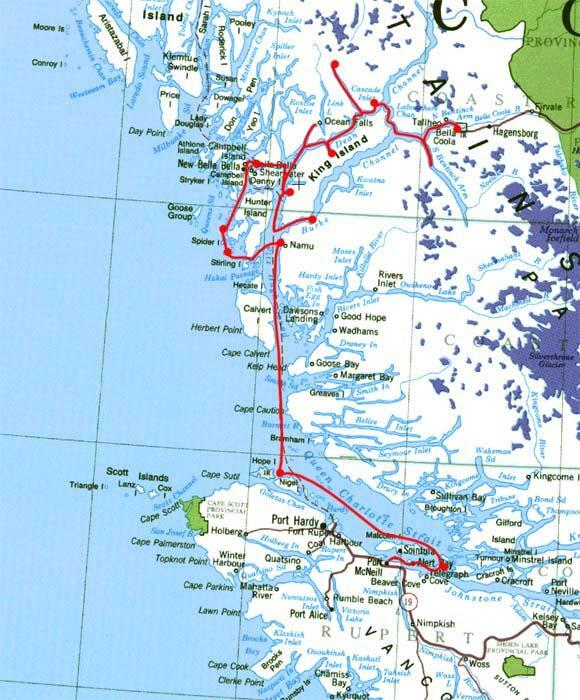 I booked another trip with Jan and the Curve of Time, this time a two week trip from the top of Vancouver Island to Bella Coola on the BC central coast. (My previous trips on the Curve of Time were Kayaking trips in the Gulf Islands.) In two weeks we kayaked, whalewatched, hiked and enjoyed many adventures! You can browse this trip in one of two ways - either click on the map for the segment of the trip, or scroll down and click on the day. Our first day on the boat, we traveled south of Port McNiell to Alert Bay. Alert Bay is a small town on Cormorant Island and is serviced by BC Ferries. Alert bay is home of has the amazing U'mista Cultural Centre and the Nimpkish Burial Grounds. Our first whales! Today was a long ride and we saw cruise ships, eagles and other wildlife. We anchored close to Hope island to try and find Sea Otters but had to settle for a great kayak. Namu is an amazing look at BC's own past. Namu used to be a fishing port and cannery but less than 10 years ago it was closed but not torn down. Today 6 people are perminant residents and many people a year visit for fishing. This place is right out of a group of seven painting. The rock is granite and shaped in many interesting ways. In the morning I took a scenic paddle in the rain with Mike around Spitfire Island. At noon we moved the boat up to Cultus sound and went for a short hike on a beautiful sand beach. Half way into the trip, we dropped off Ruth and our American friends. Bella Bella has a resident population of Bald Eagles occupying the high points in the town. Codville Lagoon is a provincial marine park on King Island and a pretty good place to call home for exploring the islands. We went on a rugged walk up to Sagar lake and enjoyed fresh prawns! Humpback whales! We took a day trip down to the Nootsum River for a paddle in the river and spend some time fishing. Today we started to head inland. We stopped at Ocean falls - once a town of three thousand, the permanent population now is close to a dozen. The massive damn in the back used to power the city, power the pulp mill and power the wood mill. Today it powers the remaining population and Shearwater using just 1/3rd of 1/4 of the capacity. We ended the day in Jenny Inlet - a calm inlet that was logged in 1992. Drive up to Dean Channel, turn left and you come to the Alexander MacKenzie Monument - the furthest west Alexander got on his cross Canada trip. From there we took a left and drove up Cascade inlet and into the most beautiful geography of the trip. Cascade Inlet was so amazing, what could we do to top it? Eucott hot spring was once developed (the remnants of the pier are still visible) but today it's close to natural (the pool is still made with concrete). I had a soak I won't soon forget. This little brown jobby is one of the most tame wild animals I have ever met and we were very glad to have him on board. I'm so glad I found your site. I don't know when we will be able to cruise this far north but the photos are great and it makes me want to go even more!